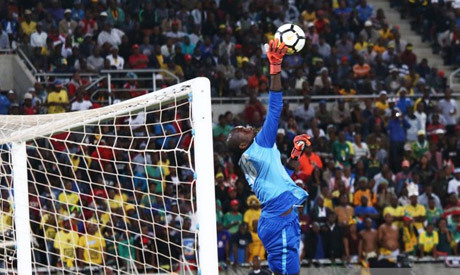 Horoya goalkeeper Khadim Ndiaye has voiced confidence ahead of the Champions league clash against Ahly set to take place in Cairo on Saturday. The Guinean side was held to a goalless draw at home by Ahly in the first-leg of the Champions League quarters last week, and they are looking for a positive win in Cairo to reach the competition's semi-finals at the expense of the Cairo giants. "I believe that we can do it," Ndiaye told Horoya's official website on Thursday. "We are well prepared and we played well during the first-leg." When asked if his side will be under pressure on Saturday's clash, the Senegalese keeper said there will no pressure on his side, stressing it is Ahly who will suffer from the pressure. "The hosts will be under pressure, not my team. They will be eager to score and certainly they will suffer a huge pressure." The Senegalese keeper, who was a part of the Senegal national team that participated in the last World Cup, missed the first leg due to automatic suspension but will be ready for Saturday's clash after serving a one-match ban.